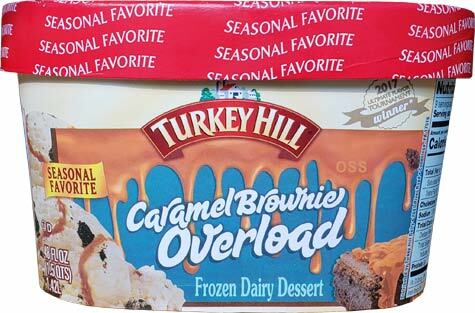 ["Returning" for 2018] Turkey Hill did a flavor contest last year (something akin to march madness) and the winner was Caramel Brownie Overload ICE CREAM. Why do I do all caps like that? Because I am a stickler for details and if people voted for an ice cream to return, it shouldn't come back as a frozen dairy dessert. Right? Good part: lots of brownies! Look, we all know I don't like frozen dairy dessert, but it's pretty slow right now and I should be able to pawn off most of this on my family. If you want to go a step further, I specifically don't like the combination of caramel and FDD even more, I think something always happens and the two make each other taste/feel worse. It's my opinion and I'm sticking to it! That said, I really like the brownies here. They are ooey, gooey, stick to your teeth brownies. Not that sticking to your teeth is the best thing, but it's different and fun. I'd love to see the brownies in a less gummy base though maybe not a chocolate base because sometimes those can take the edge off the fun factor of a good brownie bit. I won't tell you to avoid this one, but I wouldn't rush out for it either. 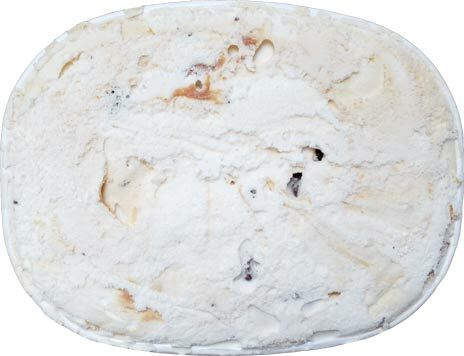 On Second Scoop: Back again for a small serving and there's still not much to say. I am enjoying every brownie I find, but I just can't get behind this texture. Now, I never like frozen dairy dessert in better, but Turkey Hill has never been able to master it. They should stick to the all natural stuff. Oh geez, i had missed that news from yesterday but just looked it up. what if they sell TH to some like Dean's who takes the quality down a notch, or what if they just lower the quality in general? Oh man, that scares me a bit, especially with the current market setup. I didn't know kroger owned TH, it surprises me since they sell that brand here(NY) even there are no Krogers in this region. But I had a question about all this--what exactly is a FDD, what separates it from ice cream, are there exact stipulations? Cause all the lower calorie ice creams in the halo top vein call themselves ice cream so it can't be based on percentage fat. @RG: Kroger bought them in 1985, but they've been making ice cream since 1954. Being owned by a bigger corp doesn't necessarily limit you to this or that. Check out http://www.onsecondscoop.com/2008/05/keep-it-fresh.html to see who owns what. 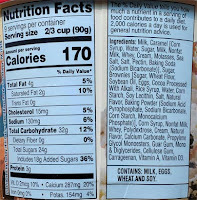 FDD is frozen dairy dessert. I get sick of writing it out so shortcut as FDD. It has to do with milkfat content and air overrun. I too do not know how they get away with calling it "healthy ice cream". 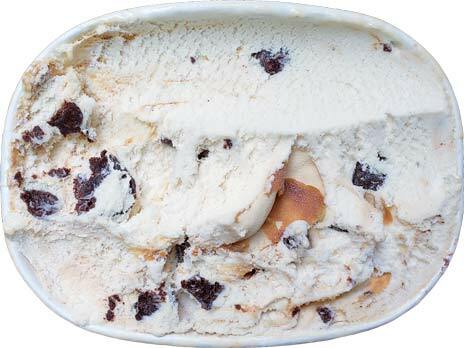 Dubba and to all your other ice cream "insiders": Thank you so much for sharing your knowledge of the ice cream industry. I learn so much from the comments you share, and I can tell how much of an aficionado you are--for instance, I never considered how grocery stores stock their ice cream products and the effect it has when you open up the container at home. I love this blog. Anyways, I live in the Milwaukee, WI area and in our local news, there was a mention of Kroeger's (the 3rd largest grocery chain who recently took over most of our supermarkets); they are now looking to sell off Turkey Hill ice cream to the most promising bidder. They said they want to focus on other products at this time, which may be in line with your other commenters' ideas on the protein ice cream trend. In general, Kroeger wants to go with what is popular right now, including home delivery, meal preps, click-and-collect groceries, and gas stations. On another note, Dubba, if you ever get the chance (and if your health issues allow), could you try the new Salt & Straw "veggie" line-up? Sounds interesting. Thanks again for sharing all the secrets. Right, different articles dive deeper in to the reasoning about why they want to divest (they dumped all their convenience stores earlier in the year including the turkey hill branded ones). They try to clarify that Turkey Hill isnt a burden but believe it would be better in someone else's hands. I hear only good things about west coast companies like salt & straw but deep down I am still a cheap skate and unwilling to shell out so much for shipping ice cream. I prefer the thrill of the local hunt. Technically I could contact them and ask for samples, but that's never been my thing. I love free samples, but I rarely initiate contact (though I'm sure I have at least once or twice). Speaking of Turkey Hill...I have always boughr their Butter Pecan. Last week I bought it and noticed the band around the container was different but did not think anything of it. I figured they just redesigned the carton. After tasting it I immediately could tell it was not the same and not in a good way. I go to look at the container and what do I find...Frozen Dairy Dessert". 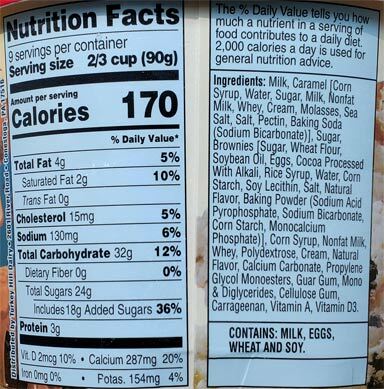 I contacted Turkey Hill and they told me due to the high cost of ingredients they are using the generic term Frozen Dairy Dessert but are using their light ice cream recipe. It cannot be their light ice cream recipe since they are not calling it light ice cream. Anyway for anyone who likes their Butter Pecan Ice Cream it has been discontinued and only disgusting Frozen Dairy Dessert will be available. I meant to say bought not boughr...can you edit to the correct spelling..
@Jilly: oh geez, they have a whole frozen dairy dessert section on their website now, only 7 flavors but you know more will switch. Booooo. I'd rather see them go to quart size than go frozen dairy dessert. P.S. Dont worry about typos, I make a zillion of 'em!